Is there anything to see and do in Bojonegoro? Flash back to few months ago, when me and my two other friends had a casual chat over Twitter about chances to collaborate together one day. But who would expect that the day came faster than we thought. Bojonegoro was chosen to be the place where we would go and Dewarna Hotel and Convention would be the place where we would spend two nights at while exploring the area. February 11, 4.30 am, I was there at Soekarno-Hatta Airport with one of my friends, Leonard, ready to depart to Surabaya. We were set to meet Hartadi and Imama at Surabaya Airport and then head to Bojonegoro together. It’s been long since our last trip together and it was exciting to finally meet up again, especially with one friend whom we have known for long but never met face to face yet, Edy, which would also join us right at Bojonegoro. The journey from Juanda International Airport to our hotel in Bojonegoro took us about three hours. Again, people may ask me why I want to travel such long hours to the place I don’t even know. Stay tuned, as I am going to show you what I saw and I did in Bojonegoro. But first things first, we can’t deny that choosing the right accommodation for a trip is equally important, too! So, let’s find out together what Dewarna Hotel and Convention that accommodated us for our three days two nights in Bojonegoro has to offer! 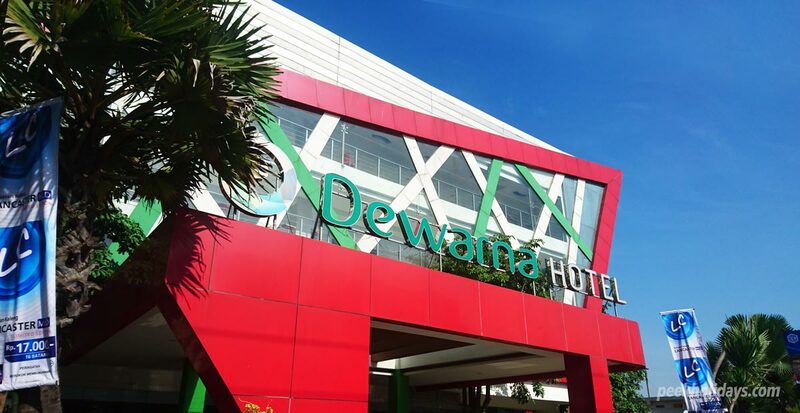 Dewarna Hotel and Convention has become one of the best hotels in Bojonegoro since its opening in 2013. It is rated as a 3 stars hotel in the area with the facilities that is beyond the rating. The location which is just next to one local big supermarket as well as the distance that is not far to the town centre, are two of many other reasons that make this hotel deserves two thumbs up. Dewarna Hotel and Convention is the right accommodation to stay with all the modern and up to date style at reasonable cost. That is the message they want to deliver to their guest through their “Smart Way to Stay” slogan. Their effort to fulfil their promise can be seen from the relevant upgrades that are being done phase by phase around the hotel to improve staying experience of the guests and meet their needs. We reached Dewarna around lunch time and the check in process wasn’t hassle at all. Me and Imama still had time to unpack and rest for a while in our room before we went for our lunch later on. We got a deluxe twin-bedding room with a window bay with swimming pool view on second floor. The room was clean and spacious enough for both of us and our luggage. I looked around the room and what caught my attention most was the bed cover with batik prints! No white plain bed cover with colorful bed runner like what usually other hotels use. It is unusual but it does give a unique touch to the bedroom. De Colour and Dewarna. ‘Warna’ means colour in Indonesia. As colourful as the hotel is, so are the foods. We had our lunch that day at De Colour Restaurant which is still part of the hotel. We had few signature dishes prepared for our lunch that day and I specially love their “Asem-Asem Daging Daun Kedondong” soup. I love soup and pretty picky about soup but for this, I would recommend you to try it, too. It tastes a little bit sour but refreshing. Their Grilled Fried Rice is my second favourite among the dishes. Yes, fried then grill. Double knocks. Their ‘Kung Pao Chicken’, Sweet and Sour Fish and Fried Spring Chicken, no need further comments. Thinking about it, my saliva almost starts drooling already. De Colour Restaurant serves Asian and also Western foods. I totally heart for their Asian foods. Yumm..yumm..! Dewarna is more than just a hotel. Besides gym facilities and swimming pool, Dewarna also has other facilities to support business purposes or to hold special events. It is probably the only hotel in Bojonegoro with such complete facilities. They have meeting rooms and also function halls that can cater groups from as small as 50 people to up to 700 people event, suitable for press conference, wedding ceremony or even trade shows. Just relax by the swimming pool is not a bad idea, too! Multi-purpose Room. Say hi to my friends, Edy and Leo! Although we may not always have time to swim, but to see a hotel with swimming pool is always delightful. Edy who stays in Bojonegoro was surprised to know that the entrance fee to the swimming pool for non-staying guests is so reasonable – only IDR25.000,- (about USD2) per entry with compliment of one bottle of mineral water and also including the towel rental. Plus, based on the information I got, the swimming pool in Dewarna is much bigger than what any other hotels have around the area. And another good news is, there is a swimming pool for adults as well as for children. So, Moms and Dads, family time it is! To find out further information about Dewarna Hotel and Convention, do check out their website. See you soon in Bojonegoro! So, are you convinced already with what Dewarna Hotel and Convention has to offer? Which part of the hotel that you love most? Have you been to Bojonegoro? Share your thoughts in the comments. Next articleWorld Forestry Day: Why I Love Forest and Why You Should, too!